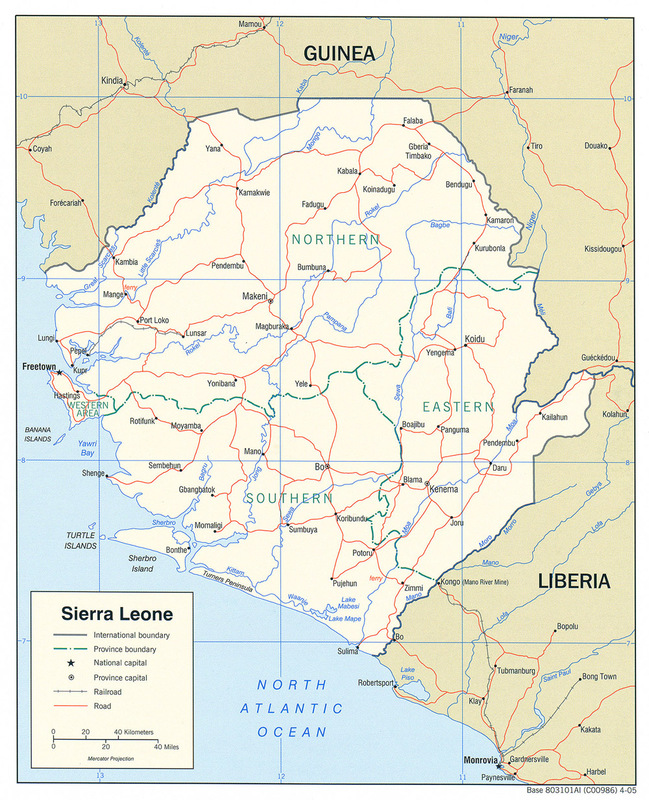 Sierra Leone(sɪˈɛərə lɪˈəʊnɪ, lɪˈəʊn) is bordered by Liberia and Guinea. Its location is 8 30 N, 11 30 W, with area of 71,740 sq km. Freetown is the capital. The population is 5,245,695, with a life expectancy of 55.69 years. The population is 35% Temne, 31% Mende, 8% Limba, 5% Kono, 2% Kriole, 2% Mandingo, 2% Loko, and 15% other. Sierra Leon is 60% Muslim, 10% Christian, and 30% traditional. 46.9% of adult males can read versus 24.4% females. By the third century B.C., Sierra Leone was occupied. Major groups arrived in waves around the 12 and 17th century A.D. from the Futa Jallon region. The Temne and Limba arrived during the 12th century A.D. The Mende arrived in the 17th century. Futa Jallon was the center of a Fulani jihadist state that was able to encourage the spread of Islam. Europeans arrived in 1462. A major trade in slaves began. In 1808, Freetown was founded and a new culture developed called Krio, which fused the native African cultures with the British culture. In 1850, 50,000 freed slaves moved to Freetown. In 1896, Sierra Leone became a British protectorate. In 1961, Sierra Leone got it's independence. Sierra Leone experience numerous coups. Siaka Stevens ruled from 1968 to 1985. He was succeeded by Joseph Saidu Momoh in 1985. In 1992, the country experienced a coup led by Valentine Strasser. Strasser was deposed in another coup in 1996. Ahmad Tejan Kabbah became the elected president. In 1997, the country errupted in civil war. Peace was not achieved until 2001. The civil war claimed 50,000 lives.